Freedom Designs, Inc. has always been known as a custom company where all of our products are ordered and built from scratch. This gives the "Rehab Community" more options for customization. We also have had requests from dealers to offer some products that could be ordered as stock items. One of these stock items was positioning belts. Our Positioning Belts can still be ordered custom with special fabrics or foams, but we are now offering our "Streamline Positioning Belts", that can be ordered as a stock item. The Streamline Belts will be manufactured in "standard" configurations with set pad sizes, standard webbing sizes and a set direction and placement of "pull" buckles. The Adjustment Buckles include a dual pull, center pull, and rear pull set up. The Pads will be sewn to the webbing to limit sliding, and will only be offered in black. The inside of the pads are made of a soft knit material that touches the body and a fine "sailcloth" for the outer surface. The pad sizes will range from 4.5 x 1.5, for the x-small, to 9.5 x 2.75 for the x-large. The Webbing is a soft easy- to-adjust style that will attach to the frame with a triangular plate, "H" buckles combo or with traditional grommets. 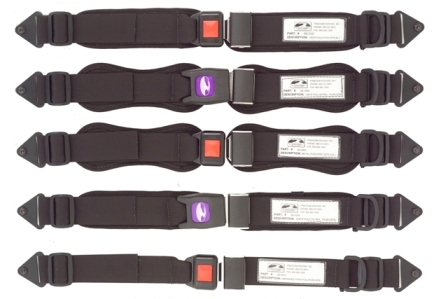 The range of belt sizes will be from extra small to x-large with all our popular buckle styles ( "plastic squeeze release", plastic push button, "metal push button", and "airline"). The belts will come in a packaging sleeve that will have the size and model number displayed, which will make stocking in your shop easier. A sizing chart and price list are available. We feel the new Streamline Pelvic Positioning Belts will be another useful tool for the "Rehab Community".